Grace Darling (1815 -1842) was an exemplary heroine of the Victorian age. The daughter of a lighthouse-keeper, she found fame by being involved in a dramatic rescue of several survivors from a shipwrecked steamer. Her name would have been familiar to our nineteenth century forbears and it is still recalled in lists of Great Britons to this day. 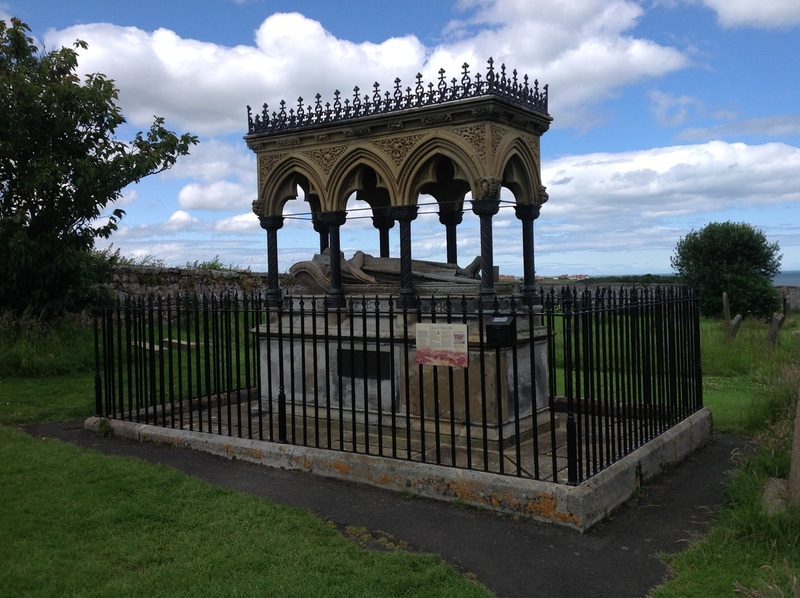 During a family holiday to Northumberland this summer, I took my wife and son to Grace Darling’s grave, in a churchyard overlooking the North Sea at Bamburgh. Our visit to Darling’s grave was driven by my interest in Robert Gilchrist’s work. I’ve found myself increasingly drawn into making connections between the literary past and its material remnants. As the process of recovery of Gilchrist’s work continues I find myself more drawn into trying to narrow the historical distance between myself and my ancestor by visiting the sites mentioned in Gilchrist’s poetry and songs; standing next to the buildings, graves, statues and monuments that inspired him nearly two centuries ago. Gilchrist wrote two sonnets in tribute to Grace Darling. His ‘Sonnet to Miss Grace Horsley Darling – The preserver of the passengers saved from the wreck of the Forharshire steam-packet’ was published in the Newcastle Journal on 22 September 1838, making it one of the earliest – and I now claim, the earliest - celebrations of Darling’s courage. The sonnet followed a week after the first detailed account of the heroic rescue appeared in the Newcastle Courant of 14 September 1838, and was one of a number of poems composed by private individuals in the weeks that followed the news. As one local observer later commented of the Darling’s heroic rescue: ‘Seldom has any solitary incident in the annals of shipwreck occasioned such general excitement, or called forth so much heartfelt admiration among all classes of the community.’ The intense media interest that followed news of the deed saw journalists, playwrights, novelists, balladeers, sculptors, potters, and painters all clamour to celebrate Grace’s heroism and to take advantage of the commercial opportunities the story provided. In publishing Gilchrist’s sonnet, the Newcastle Journal was swept up in the story, utilising the talents of a local poet to convey a sense of regional pride. In peaceful contrast with the stormy seas. They die not early who have lived like thee. Whilst it cannot be certain that Gilchrist visited Grace Darling, he would have been familiar with her image, reproduced in various forms over the ensuing five years. The sonnets to Darling are unusual in that Gilchrist returned to a subject. His other dedicatory and memorial verse was written to honour friends and acquaintances, fellow Tyneside poets, and civic dignitaries, though were one-offs. Whilst the social and historical significance of many of these people has receded, that of Grace Darling persists, her effects preserved in the excellent RNLI museum. It is one place where the biographer can get a little closer to his subject.